Chad Newton is the Co Founder & Culinary Director of Asian Box. He is a Bay Area native born and raised in Northern California. He has honed his skills in top ventures throughout Northern California. 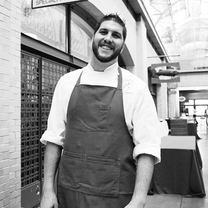 He has been a driving force behind local products and sustainability in all aspects of the menus and operations. "Eat next door in the Husk dining room for sure but start or finish here with the shaved Broadbent Ham backed with any of the amazing bourbons. They go together magically. The space is beautiful and rustic yet super comfortable." "This has always been a favorite of ours in the pizza world. Green olives, garlic, basil, chili and they just started adding ramps. Ask for the house Calabrian chili oil and get a bottle of red from Campania to tie it all together. Best pizza ever!" "The braised and grilled octopus is kind of hidden in this amazing potato purée and garlic emulsion with dots of black garlic purée. It all comes together perfectly in each bite. One of the best octopus dishes I have ever eate"
"Who can honestly say that they don't like a churro??? 180 makes killer and super traditional churros at this spot and you can watch the crew make them in the open kitchen. My favorite was the churro filled with Dulce de Leche. Super crispy, yet tender outside, and just enough filling to make the overall texture perfect." "This place kills it! Almost as busy as the PA Box. Grilled chicken wrap with a choice of 6 different sauces to choose from. Pro tip: get the French fries on the inside of the wrap not on the side!"